File hash online check MD5FILE. Source code GITHUB. 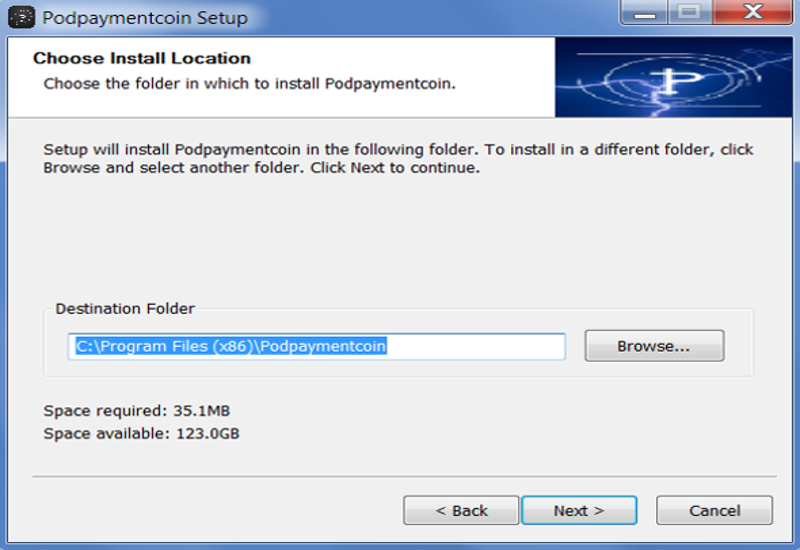 If you have an Antivirus program on your computer, it may incorrectly detect and remove POD Payment Coin. This is a false alarm. The reason for the alert is that the software contains the original Bitcoin miner component. This is required for solo mining from your PC and safe. The mining component has been approved and used in the Cryptocurrency and Bitcoin community since 2010. The two options available are 1) Disable the Antivirus software for 15 mins and run the software. 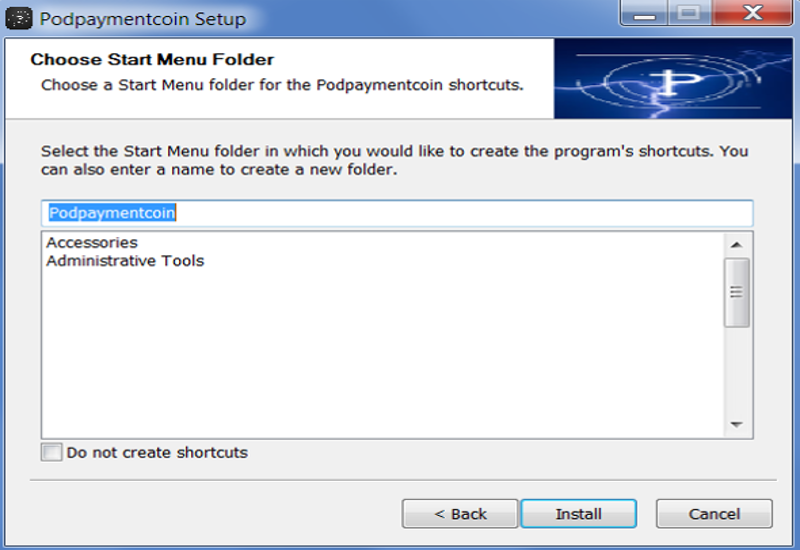 Or recommend to exclude the C:\Podpaymentcoin and C:\Program Files (x86)\Podpaymentcoin folders in your Antivirus software; reference McAfee , Windows Defender , AVG , Avast. 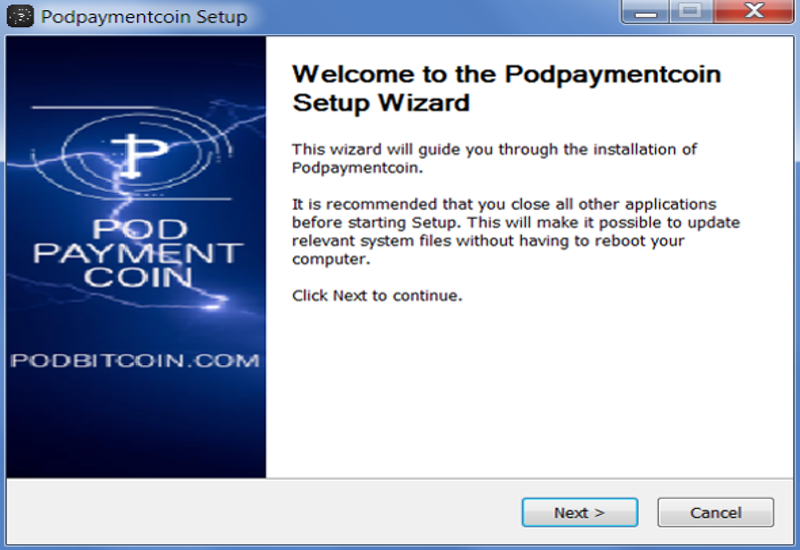 Only download the POD Payment Coin from our website (do not trust if the file has been sent to you from any other source). 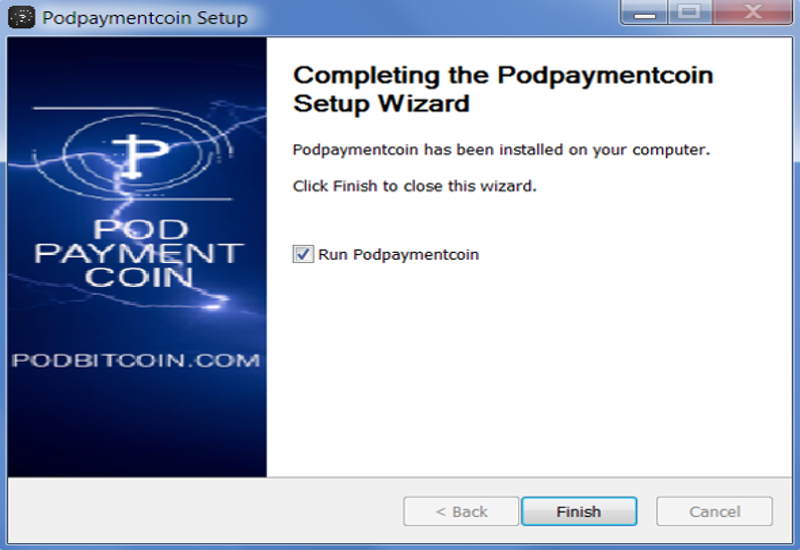 After installation, launch POD Payment Coin. 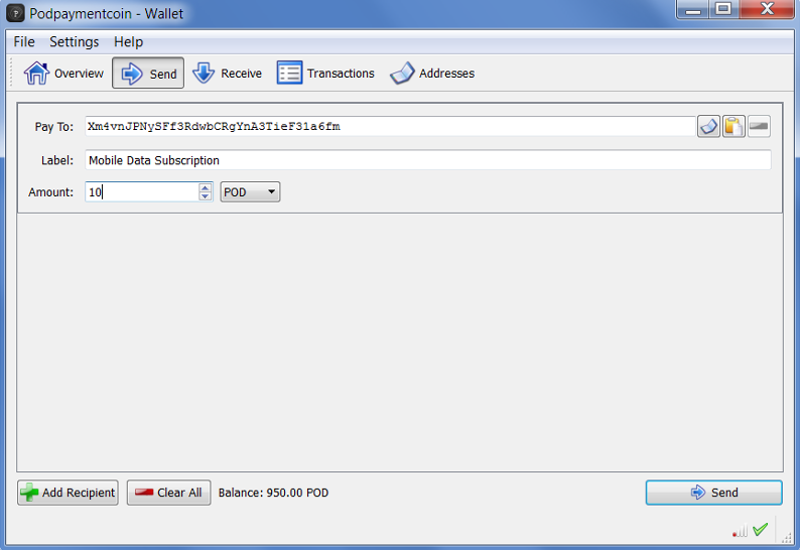 You will see this default view that shows your wallet balance and recent transactions. 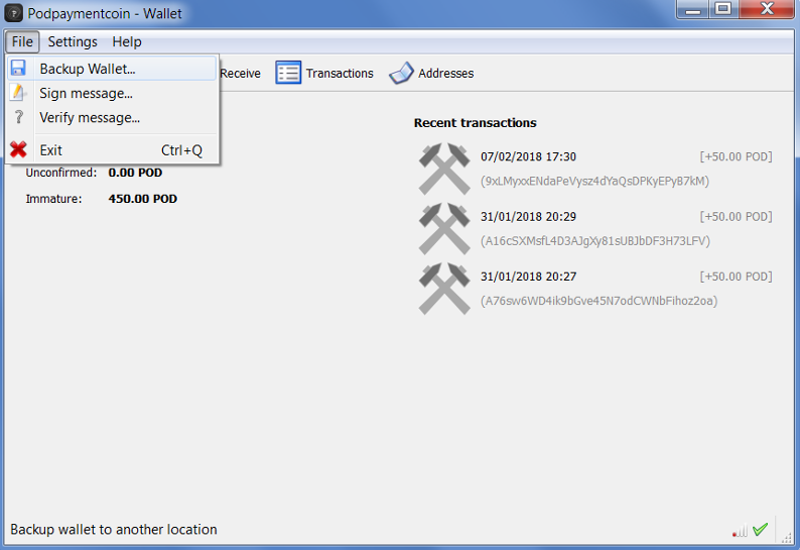 A green tick at the bottom right of the wallet shows if you are connected to the POD Payment Coin network. Sometimes it may take a few minutes to synchronise. Click ‘Settings -> Encrypt Wallet’. The first thing to do is encrypt your wallet. This is a very important step that you must perform. It helps protect your wallet and coins. DO NOT forget your password. If you lose your password, you will not be able to access your coins in your digital wallet. Choose a secure password. You can check your password strength at https://password.kaspersky.com/. 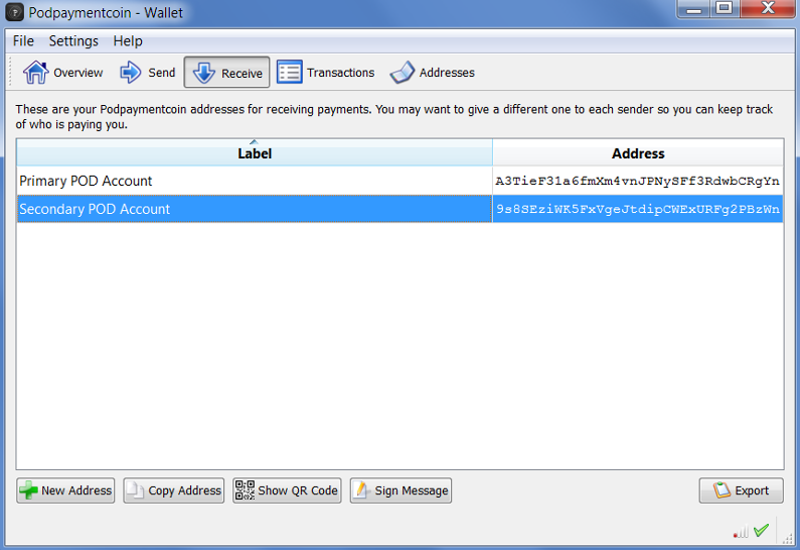 Sending coins is as simple as sending an email or WhatsApp message. Enter the persons unique address key in the ‘Pay To’ field and populate the amount. Add a meaningful reference as a label and click the ‘Send’ button. Receiving coins is just as simple. Send your unique address key from the ‘Address’ field to the payee (in the screenshot this would be ‘A3TieF31a6fmXm4vnJPNySFf3RdwbCRgYn’. They will send coins to your unique address using step 3A. The amount sent will appear in your wallet. SPECIAL OFFER: For a limited time period only, after downloading and installing our software, contact us with your unique key address. We will send you 10 free coins as a community welcome. This offer is time limited; per unique user and subject to change. 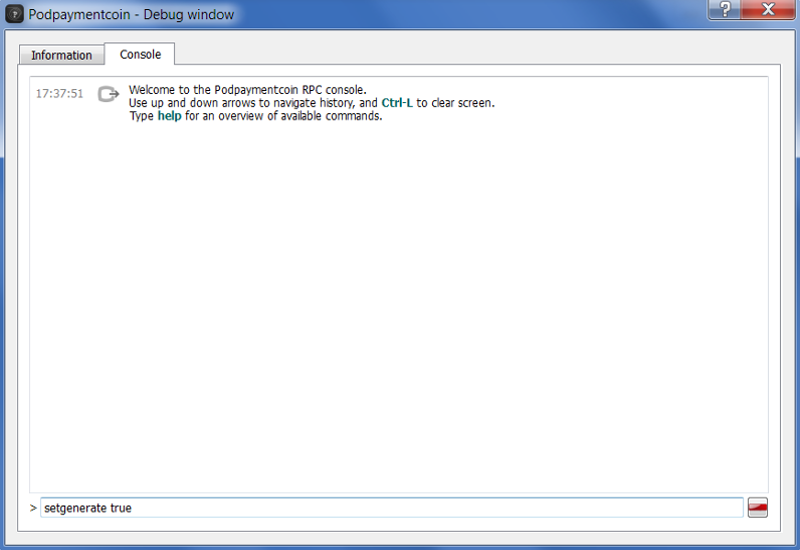 Click ‘Help -> Debug window’. Then click ‘Console’ tab. 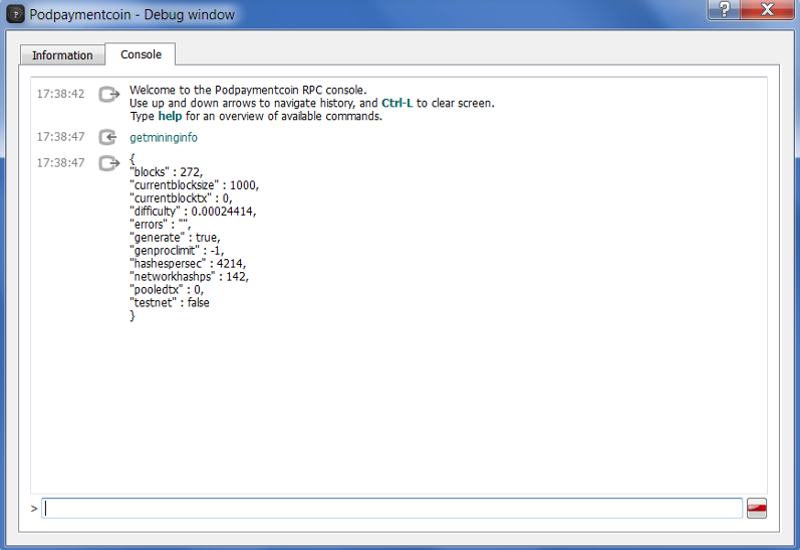 In the command line at the bottom type setgenerate true and click enter. This command starts the inbuilt mining software. 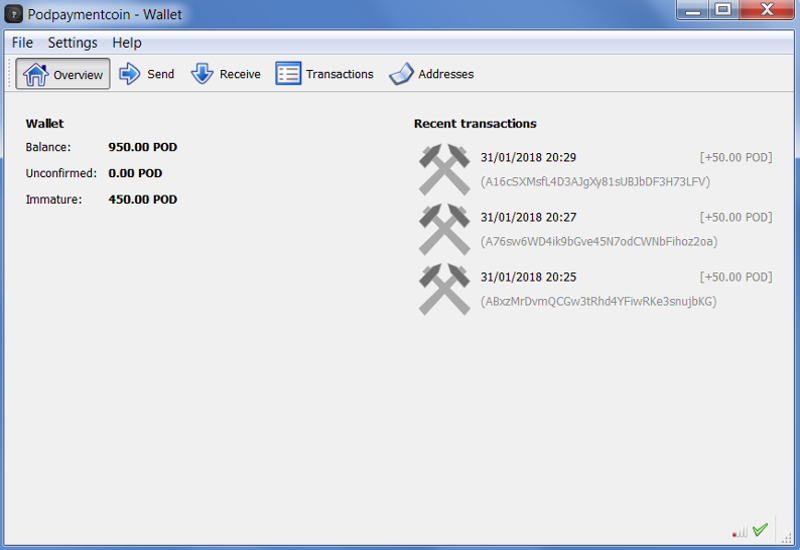 Congratulations you are now part of the POD Payment Coin network and mining. For the first 840,000 blocks to be mined, each block will reward the user with 50 POD coins. 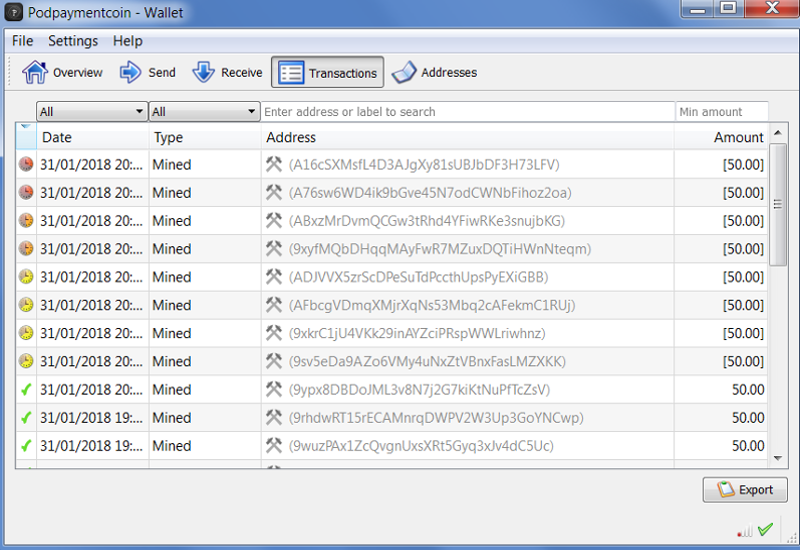 In the screenshot, you can see that 272 blocks have been mined by users. So in total 272 x 50 = 13,600 coins have been rewarded. You are mainly interested in the next block. So in this example the computer is trying to mine block 274. If the machine solves the equation the user will be rewarded with 50 POD coins. The lower the difficulty number the easier it will be to mine the next block. What does getmininginfo mean? What does getmininginfo show? difficulty = shows the current mining difficulty factor. Difficulty is increased as more users compete to mine the next block. 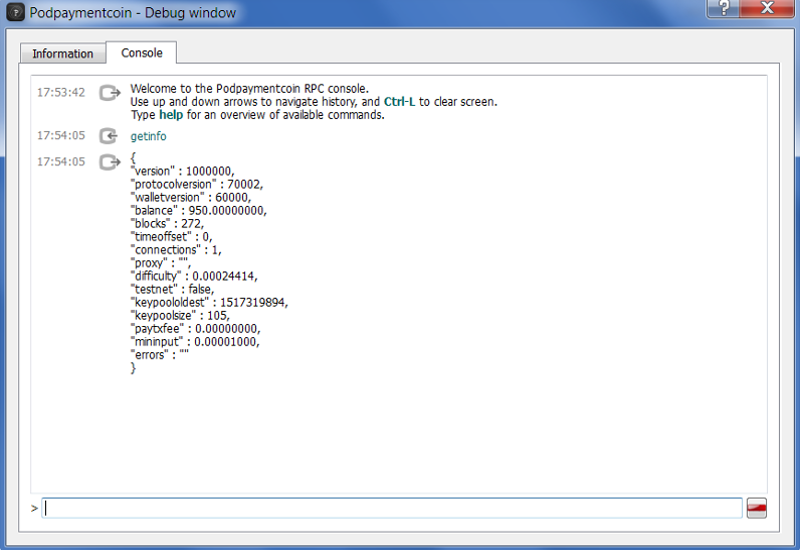 The getinfo command shows additional software version and balance information. 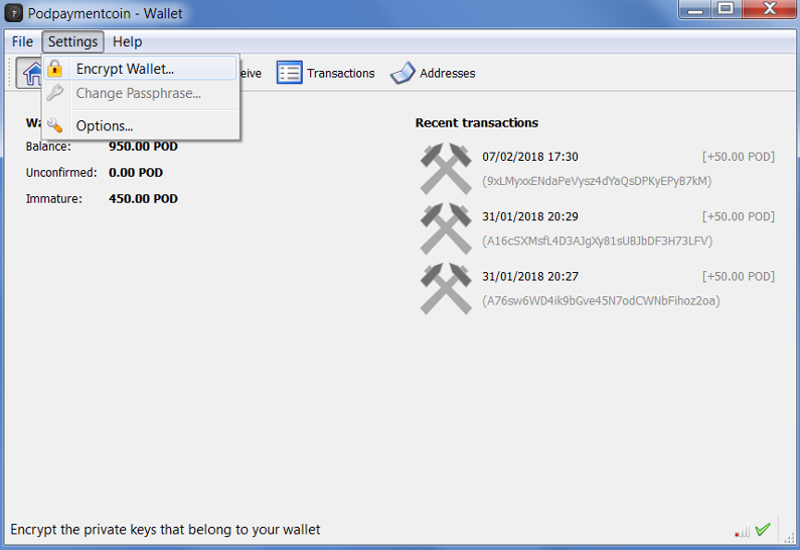 The wallet ‘Transaction’ view shows you the latest transactions; both mined coins and transfers that you have done to people or companies. It is good practice to backup your wallet regularly. In the event you lose your laptop or your computer gets corrupted, having safe backups ensures you get retrieve your wallet and coins. An estimated five billion people are cut off from a financial system. They don’t have bank accounts or credit cards. Working together, we can connect dots between new and old crypto initiatives. POD Payment Coin offers a solution that makes electronic cash accessible to everyone. Download and start your cryptocoin ownership today. It is so simple, anyone can do it. What are you waiting for? ITS FREE!